Implementing or replacing an intranet is no easy task. There are many challenges to overcome including identifying best practices for designing departmental pages. Many departments will have a wide variety of information to publish and a vision for what they want their page to look like. Other departments will not have as much use for the intranet, however still need to have a basic presence to communicate information. In order to simplify your implementation, you will want to consider creating departmental templates. For those departments with lots of content, templates will help to keep them organized and consistent with other departmental pages. This consistency will help your end users locate information they are looking for easily and give your intranet a professional look and feel. For those departments with little content, this will give them a starting point and a “fill in the blanks” type page so they don’t struggle to come up with content. Welcome message including a mission statement and/or basic information about the department and services provided. Departmental calendar for upcoming events, meetings, etc. Templates aren’t limited to departmental pages. 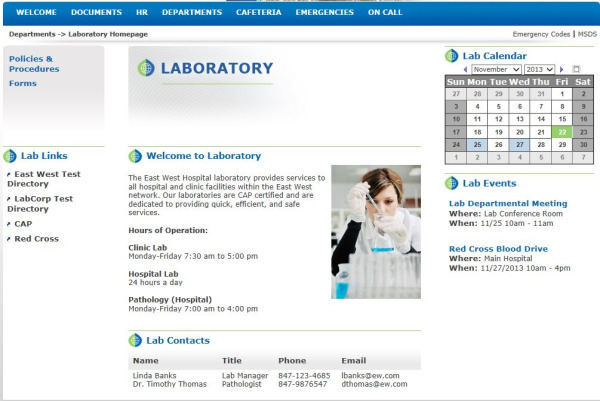 Using templates for other common pages will only increase usability and consistency on your intranet. Want to learn more about intranet best practices and implementation? Download our ebook by clicking the link below.